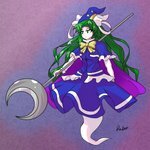 A Ghost (possibly deity) from Touhou. First encountered by Hakurei Reimu during Highly Responsive to Prayers, believed to now haunt the area around the Hakurei Shrine. Also believed to be the former master/teacher and mother figure (possibly even literal mother) of Kirisame Marisa, whom she taught several spells, like Orrerie's Sun. 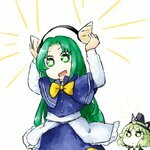 Has not been seen since Mystic Square, but many fans still wish for her return in the Windows Touhou games. A handful of cryptic comments made by ZUN in side materials imply Mima might be one of Hakurei Shrine's patron deities.